Tangy, cheesy, and vibrant lime flavors combine deliciously in this Mexican street corn salad. 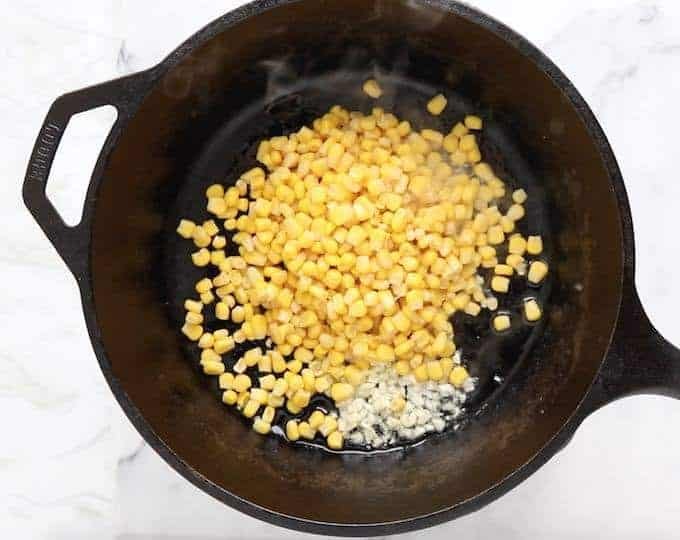 To save time, corn is charred on the stove-top. Perfect for summer BBQ’s. A lower calorie version of Mexican Street Corn salad that’s made without mayo & can be served as a corn dip, salad, or as a lettuce wrap. 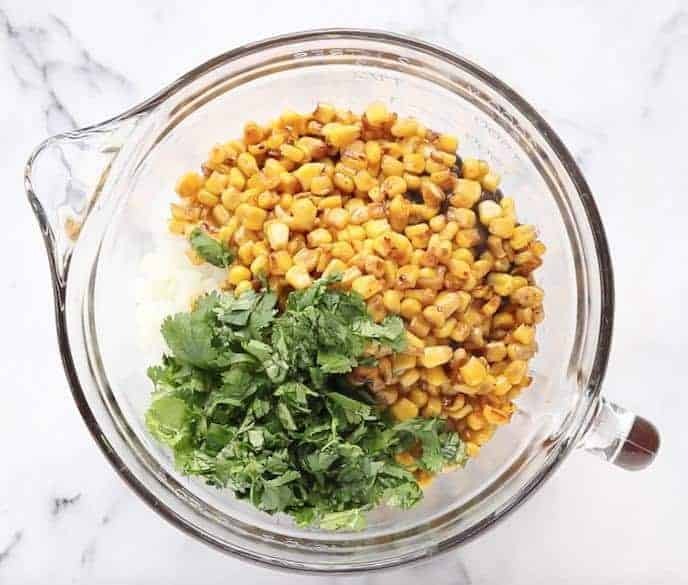 This Mexican street corn salad is a spin on traditional elote corn, which is simply Mexican corn on the cob. It’s typically coated with salt, chile powder, butter, cotija, lime juice, and mayonnaise or crema fresca. Our version cuts calories, not flavor, by getting rid of the butter and mayo, but keeps the chili powder, cotija cheese and lots of lime juice! 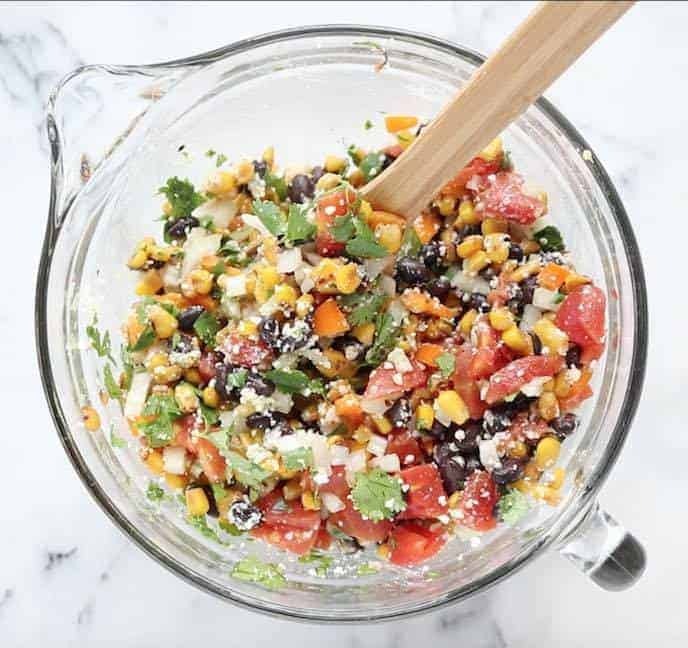 We take this delicious treat and make it the perfect accompaniment to any BBQ or summer party turning it into a salad that takes no time at all to prepare, is less messy, and is easier to serve than hot corn served to a large group. 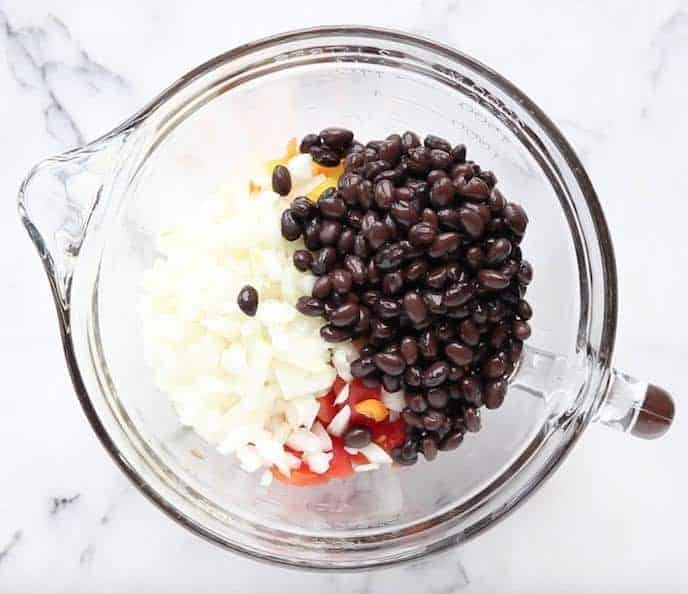 Take a look at how easy this salad comes together by watching the recipe video or keep reading to see how simple this salad is to put together. Start by prepping the ingredients. It’s always quicker to put together a recipe when you have all the ingredients ready to go. 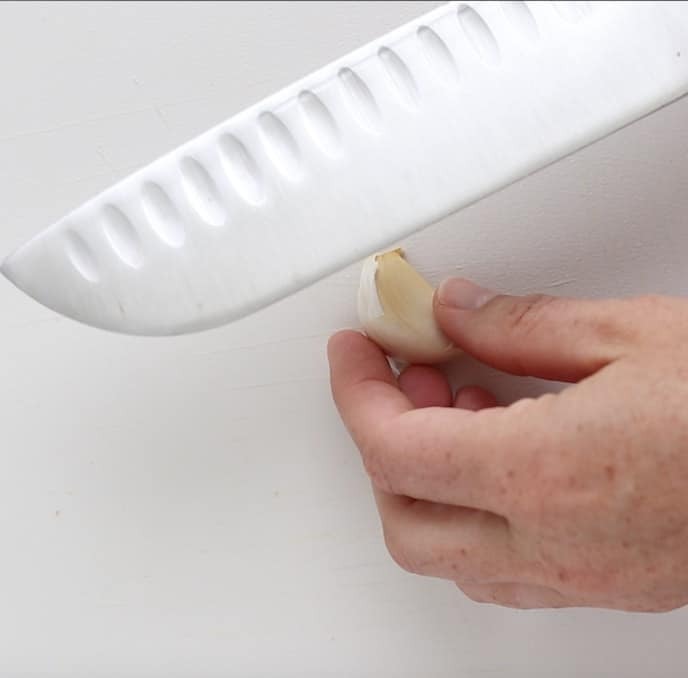 Use a kitchen knife, place it on top of garlic, and carefully smash with the palm of your hand. 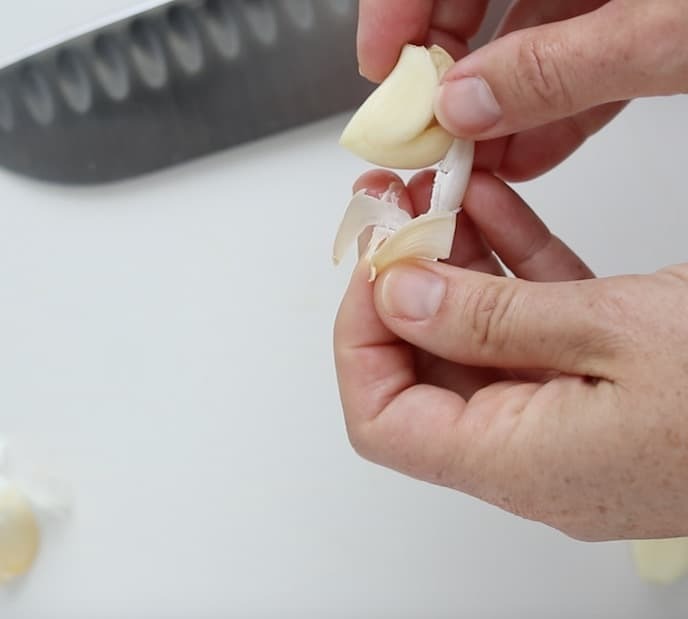 Peel the skin from the garlic and mince! 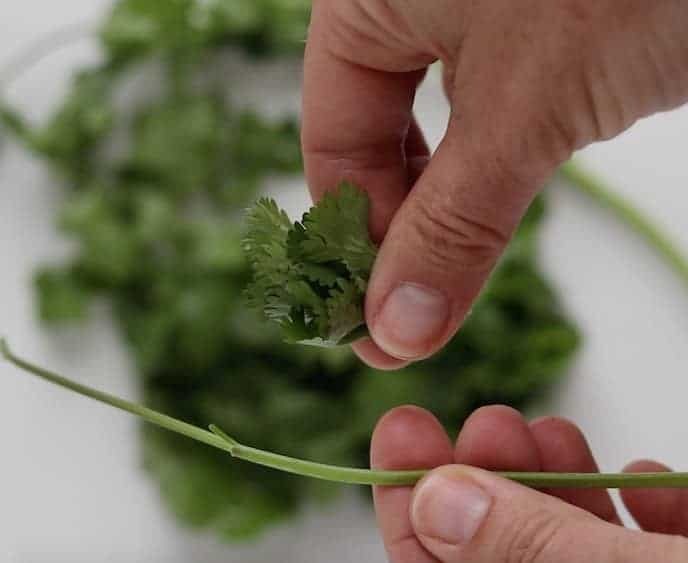 KITCHEN TIP: Take the time prior to chopping cilantro to remove the leaves from the stems. 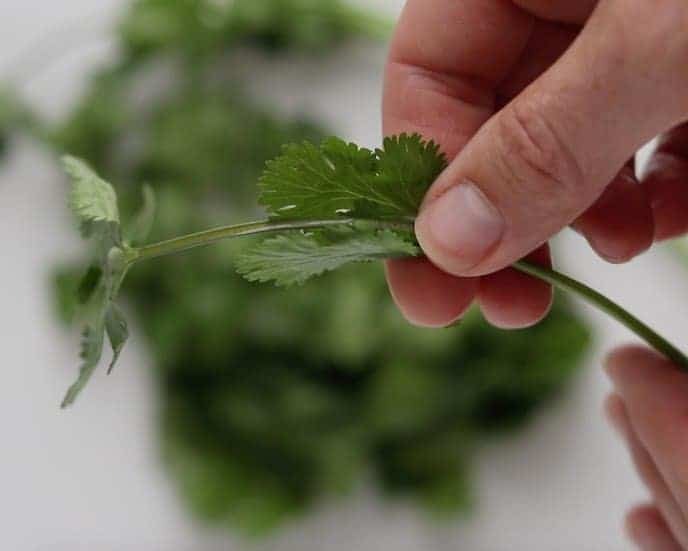 It takes only a minute to do and you won’t have any of the stem section in your recipes (believe me, I have done it otherwise, and it’s not fun to pick out). Gently pull, removing only the leaves. You now have leaves and stems. Toss the stems and chop the leaves. Traditionally this salad would be made with grilled corn fresh off the cob. That sounds pretty amazing to me, but to simplify this dish we are charring stove-top. No need for a grill, no need for in-season sweet corn, no need to spend the time roasting. Grab a can of sweet corn kernels instead. 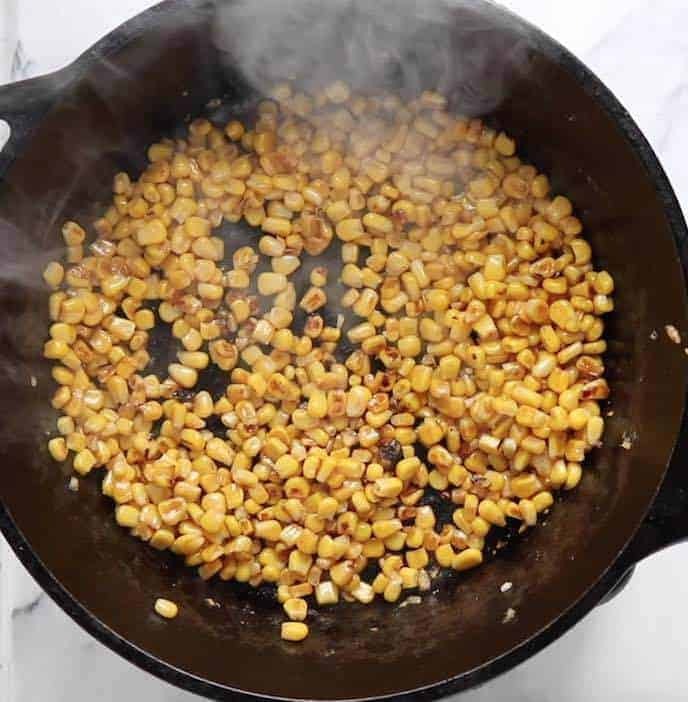 Kitchen Tip: Don’t want to roast the corn? Skip it. I’ve skipped this step and the salad was nearly as tasty as when the corn was roasted. If you’d like to take the time to roast the corn on the cob, you can do so in the oven or on the grill. 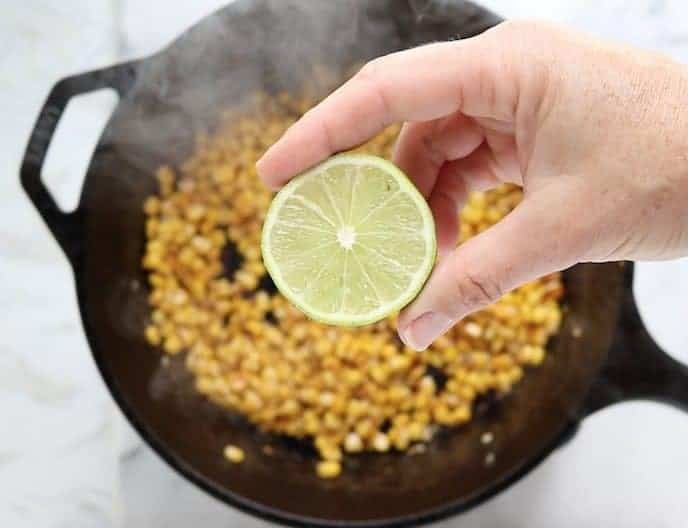 Once the corn is roasted, go ahead and sprinkle with salt and squeeze a lime into the pan. The juice from the lime deglazes the pan getting all those tasty bits off the pan and into your salad. While the corn is roasting, start making your sauce. 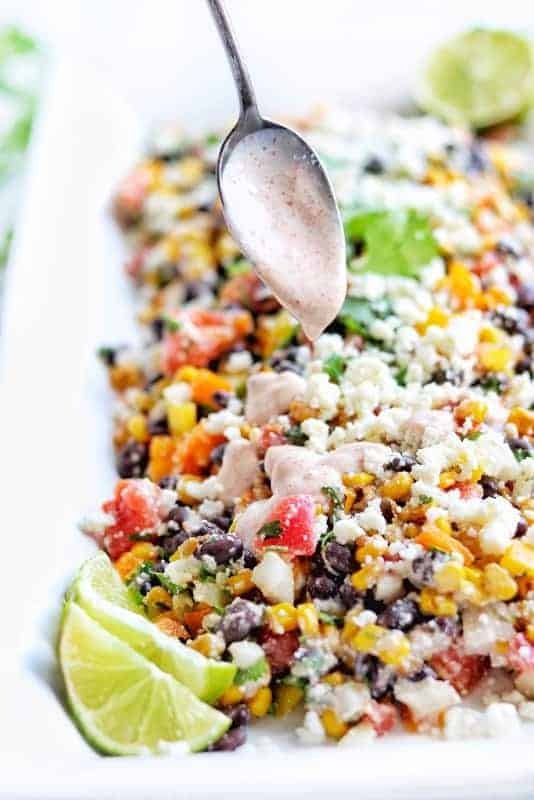 It comes together quickly and is a fantastic compliment to the Mexican corn salad. 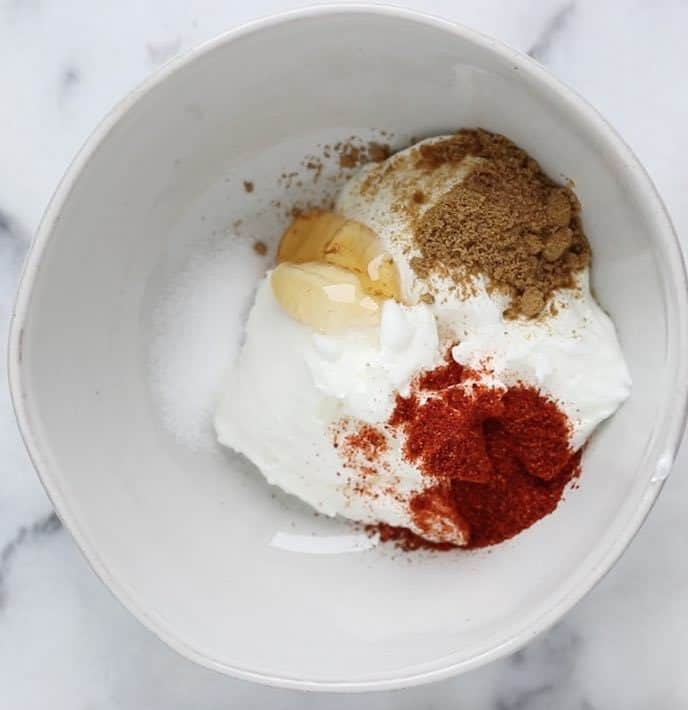 Combine the Greek yogurt, cumin, chili powder, honey, and salt. Squeeze in the juice from another lime and stir. Set aside. Now you simply need to combine the ingredients to finish off the salad. Add the canned tomatoes, diced onion, chopped peppers and the can of drained black beans. Add in the corn and cilantro. Then the cheese. Oh, the cheese. it is so delicious. Kitchen Tip: If you are not going to be serving the salad right away, hold off on adding the cheese until right before serving. Can’t find cotija cheese? Try queso fresco instead. 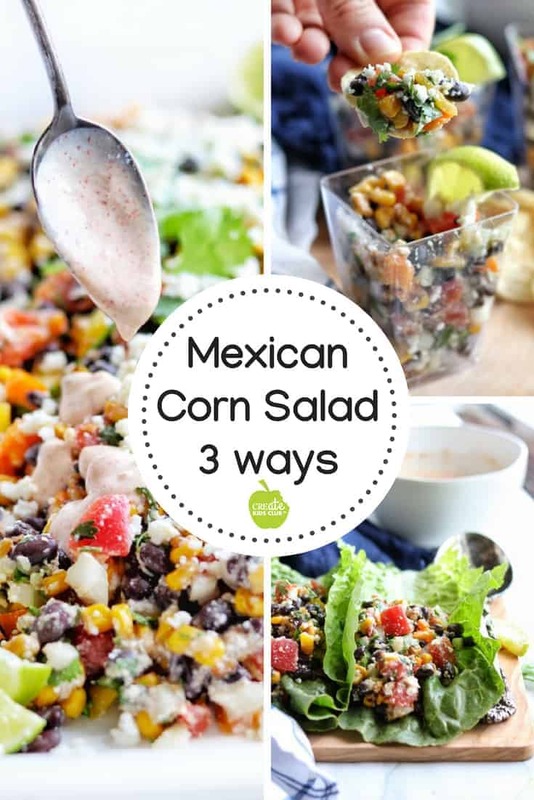 Give the Mexican corn salad a stir. This versatile dish can be served as a salad. 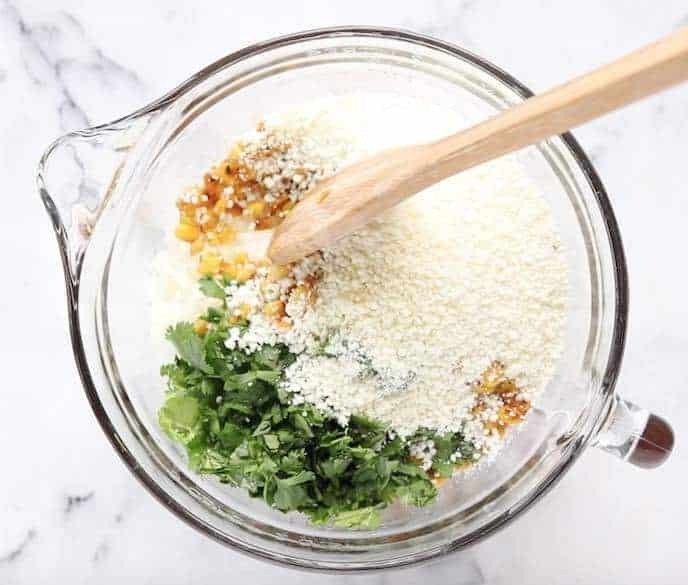 If you go this route, you can drizzle the dressing on top, stir, or offer the dressing on the side for guests to add themselves. The salad is amazing no matter which method you choose! 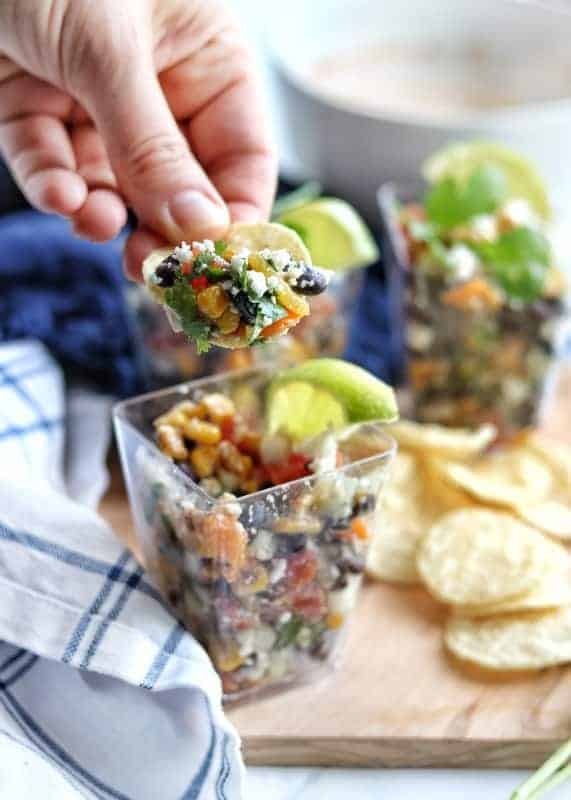 Serve as a dip with chips on the side. 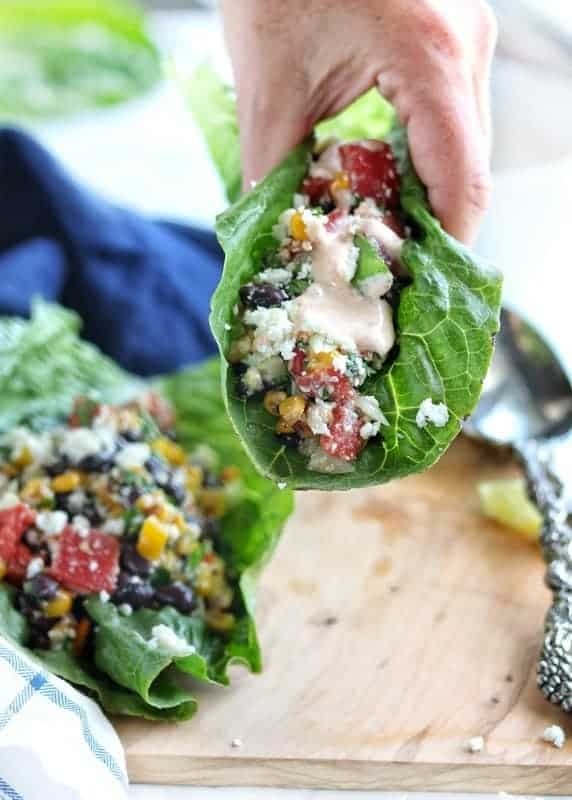 Or you can serve this Mexican street corn salad wrapped in lettuce as a delicious lunch option! For more BBQ ideas check out these delicious options: Juicy Lucy burger, crockpot baked beans, or Brussels Sprout salad. If you try this recipe, please let us know! Leave a comment, rate it and tag a photo #createkidsclub on Instagram so we can see it. I’d love to see what you come up with! This was the best salad! Everyone asked for the recipe!